Several species of flea beetles are common in Indiana, sometimes causing damage so severe that plants die. Flea beetles are small, hard-shelled insects, so named because their enlarged hind legs allow them to jump like fleas from plants when disturbed. They usually move by walking or flying, but when alarmed they can jump a considerable distance. Most adult flea beetle damage is unique in appearance. They feed by chewing a small hole (often smaller than 1/8 inch) in a leaf, moving a short distance, then chewing another hole and so on. The result looks like a number of “shot holes” in the leaf. While some of the holes may meet, very often they do not. A major exception to this characteristic type of damage is that caused by the corn flea beetle, which eats the plant tissue forming narrow lines in the corn leaf surface. This damage gives plants a greyish appearance. 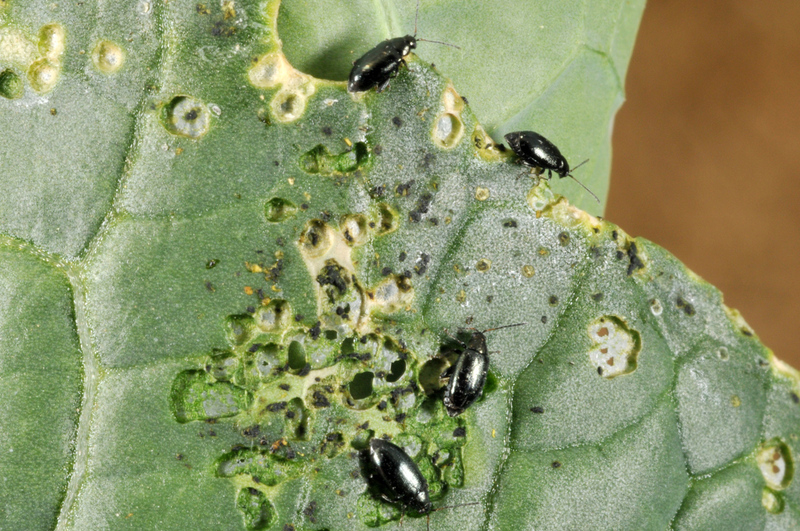 Flea beetles lay their eggs on plants or in soil around the base of plants. The tiny larvae feed on the roots of the plant, doing only minor damage to edible crops. Generally, flea beetles are not difficult to control, but often they will have already seriously injured crops before they are detected or the extent of damage is realized. Therefore, it is very important to regularly check susceptible plants, especially when they are in the seedling stage. Most species of flea beetles emerge from hibernation in late May and feed on weeds and other plants, if hosts are not available. In Indiana, some species have multiple generations per year, and some have only one. Keeping fields free of weed hosts will help reduce flea beetle populations. Flea beetle damage often can be observed on weed hosts before it becomes apparent on crops. Also, flea beetles tend to become more numerous when susceptible crops are grown in the same area year after year. Therefore, for commercial growers, crop rotation may help reduce flea beetle damage. Potato Flea Beetle is black and 1/16 inch long and is one of the most common and destructive flea beetles, attacking potatoes, tomatoes, green pepper, eggplant, and other solanaceous plants. 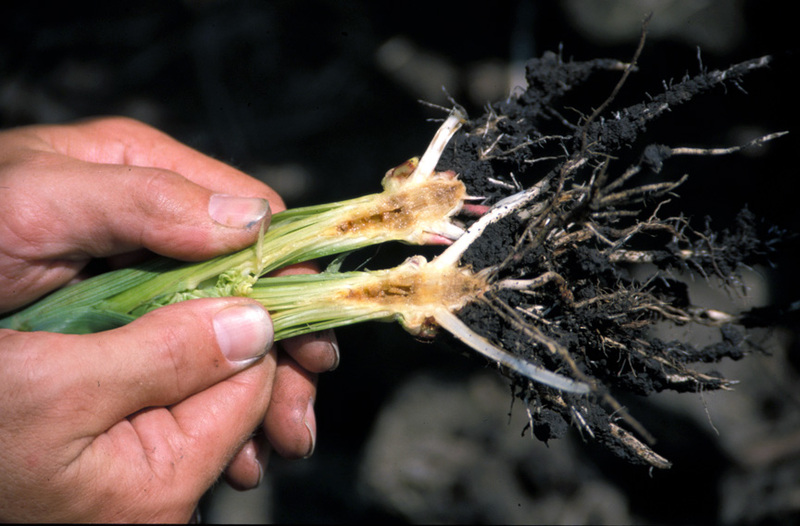 Adults emerge from the soil in mid-spring and feed on young foliage of these crops. They also may feed on sunflower, morning glory, jimson weed, and lambsquarter. Larval feeding on potato tubers may cause roughness, pits, and trails on the surface or in the tuber itself. These pits show up as black spots on peeled potatoes. Potato flea beetles are also vectors of several diseases of potato. Spinach Flea Beetle is easily recognized and is the largest of our common species. It is almost 1/4 inch long, has dark, greenish-black wing covers, a yellow-orange thorax, and a dark head. Unlike other species, the spinach flea beetle lays its eggs in clusters on leaf surfaces. Larvae feed on the undersides of leaves. In addition to spinach, adults will feed on beets, chickweed, lambsquarter, and many other weeds. There are usually two generations of spinach flea beetles per year, the first developing on weeds and the second developing on spinach and beets. Striped Flea Beetle commonly attacks cruciferous plants such as cabbage, broccoli, turnip, radish, and mustard in most areas of Indiana. It will also feed on shepherdspurse, wild mustard, and other weeds. The adult is shiny black, about 1/12 inch long, with a longitudinal, wavy yellowish stripe on each wing cover. Injury done by the adults appears as pits or holes in the leaves. Larvae may seriously injure the roots of plants, particularly turnips and radishes. 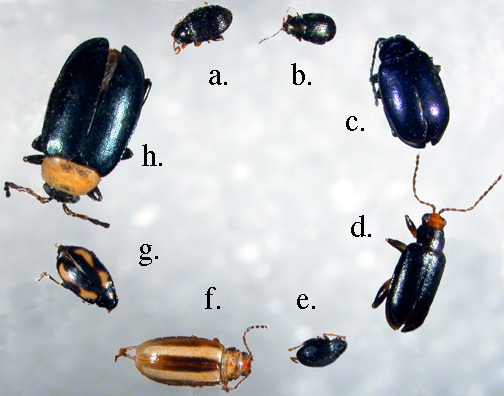 Palestriped Flea Beetle feeds on cabbage, beans, tomatoes, corn, peas, strawberries, and other crops. Weed hosts are ragweed, pigweed, and lambsquarter. The adult is about 1/8 inch long but ranges in color, from shiny reddish to brownish-yellow. A straight, broad, yellow stripe runs down each wing cover. Sweetpotato Flea Beetle is common in the southernmost parts of Indiana. The adults are small (only about 1/16 inch long), bronze-black with yellowish legs and antennae. Feeding damage by the adult sweetpotato flea beetle is somewhat different than other species. Feeding injury on early sweet potato foliage, appears as narrow grooves in the upper and lower leaf surfaces. Badly damaged leaves turn brown and die. Adults also may feed on morning glory and other plants. By mid-June they have usually left the sweet potatoes to lay their eggs near the roots of bindweed. Red-headed Flea Beetle is about 1/6 inch long and dark black with a reddish-yellow head. It feeds on cabbage, beans, beets, and potatoes, as well as many weeds. Mint Flea Beetle is about 1/12 inch long, pale brownishyellow, with a darker brown head and black eyes. The larvae, which are the primary damaging stage, feed in the soil on roots. Feeding by the adults, which is usually not serious, may cause leaves to dry up and fall from the plants, especially in hot years. Commercial mint producers may use malathion at 1-1/2 pints per acre after cutting and removal of crop from the field for control of adults to prevent oviposition. The 7-day harvest restriction should be observed if applied before cutting. Grape Flea Beetle is almost 1/5 inch long and dark, shining steel-blue. They feed on the developing buds of grape vines in late April or early May, often causing considerable injury. The eggs are laid under bark on the vines. After hatching, the brown larvae with black spots, feed extensively on the leaves. 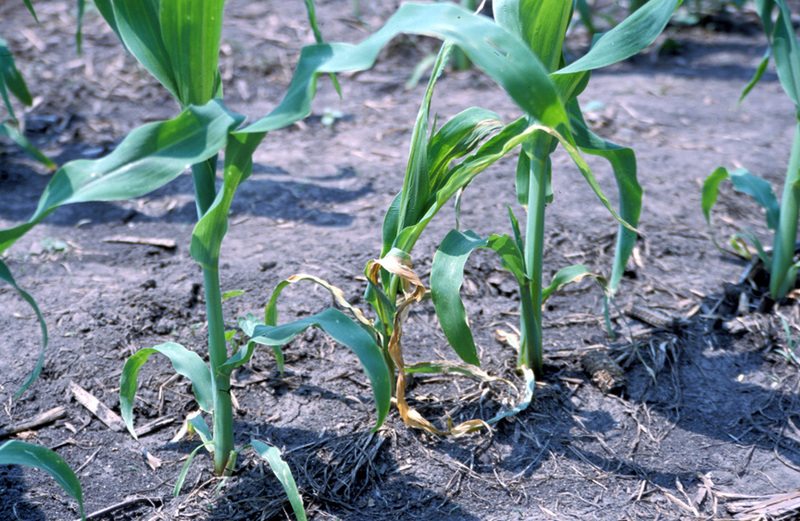 Larval damage resembles that done by corn rootworm beetles. After feeding 3-4 weeks larvae drop to the ground and pupate in the soil. In 1-2 weeks, the new adults emerge and feed for the remainder of the summer before going into hibernation. 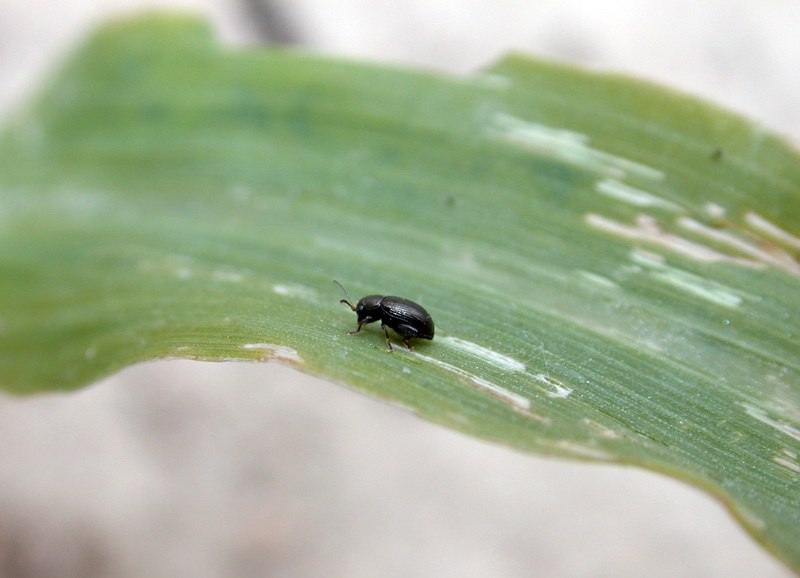 Corn Flea Beetle is a black, pinhead-sized (about 1/16 inch) insect that feeds on all types of corn. It can be a serious pest when growing conditions are poor and plants are making slow growth. Damage is generally confined to plants less than 6 inches tall. Corn flea beetle feeds by stripping the green top layer from the leaves, resulting in irregular brown or grey lines. Most importantly, corn flea beetle can transmit a bacterium that causes Stewart’s wilt. Sweet corn varieties vary greatly in their susceptibility to Stewart’s wilt. Contact your seed dealer to purchase varieties with resistance to Stewart’s wilt. Overwintering flea beetles suffer significant mortality during cold winters. To determine the potential for wilt problems in your area, add the average monthly temperatures (°F) for December, January, and February. If the sum of these three numbers is less than 90, then the disease is not expected to be serious. If the sum is between 90 and 100, then epidemics of moderate severity are possible. If the sum is greater than 100, there is a high probability that the disease will be severe. In fields where a susceptible variety is grown, check them on a regular basis if moderate or severe disease pressure is expected, based on winter temperatures. Usually, growers in southern Indiana can expect more serious problems than growers in the northern part of the state. Most plants can tolerate considerable flea beetle feeding. However, younger plants could be killed, and older ones may suffer from water loss and reduced photosynthetic capability. See ID-56, Midwest Vegetable Production Guide at https:// ag.purdue.edu/btny/midwest-vegetable-guide/Pages/default.aspx for insecticide recommendations for vegetable crops. For grapes, see the Midwest Fruit Pest Management Guide at https://ag.purdue.edu/hla/Hort/Pages/sfg_sprayguide.aspx. Home gardeners should see E-21 Managing Insects in the Home Vegetable Garden at https://extension. entm.purdue.edu/publications/E-21/E-21.pdf.